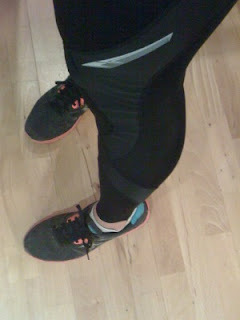 When running gear gets too technical, I tend to bow out. Sure I'll lust over it, but the chances of it finding its way into my closet is slim. First, and probably foremost thanks to my budget biding, the price tag scares me off. Can you blame me for passing up $90 spandex when I can find something similar for half the price? Then I question how effective said product really is. Do I truly need all those bells and whistles especially when I can dig through my drawers at home, double up on a layer or two--yes, I'm the one who completely overdressed for a 25-degree day run and was soaking wet upon my return, not from falling in the snow--and gain the same benefit? Give me a good pair of shoes and a sports bra and I’m set. I'll piece together the rest: $1 stretchy gloves, a fleece headband I've had since I was 12, the $5 fleece-lined jacket I bought so as not to ruin my favorite, more pricey number. Except after trying the CW-X Stabilyx tights, and their gift of magic legs as I like to call them, I’m eating my words in the gear department. If you can put a price on super powers, here's a case where you can't object to the price and you'd be remiss to pass up the targeted support component. Magic legs? Stability that starts in the core and works all the way down my calves to keep my muscles in go mode without weakening beneath my flimsy ankles and injury-prone tibias? You can’t compromise that. In November, I ran five miles at a speed I couldn’t match three months prior (when my darn injury finally let me hit the roads again). Last week, I ran intervals until my legs should have fallen off. Yet they didn’t and I’m no worse for the wear. Nope. It's like the ankle brace I'm tempted to wear when my shins ache as I pad around the house masks itself in the tights and holds everything in place when I run. Even while sitting at my desk in my tights--like when yesterday's run ran afoul and landed on the treadmill instead of the trail--I feel locked and loaded. Must be that "harnessing of the midsection" that my mind is embracing. My muscles are digging the compression even though the performance benefits might be minimal—it’s all about psychological wellbeing here, no "glowing review" to appease the peanut gallery from this wear-tester. And when the weather turns cold, I need those magic legs and the running-on-air sensation for as long as I can get--even when I feel like a stuffed sausage. Nah, I'll take the sausage casing look if it makes me faster. Note: a version of this appeared in a compilation at ffcheer.posterous.com.